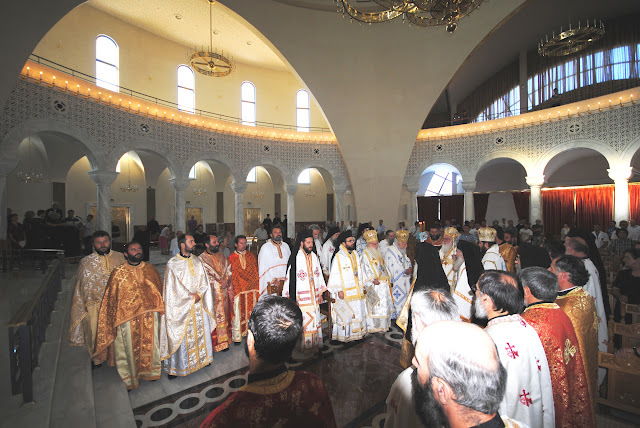 On August 2nd in the new “Resurrection of Christ” Cathedral in the capital, the celebration took place of the 20th anniversary of the Enthronement of His Beatitude, Archbishop Anastasios; one of the most significant moments in the path of the canonical restoration of the Orthodox Church after the fall of the atheist regime. This celebration followed the superb celebration on the 24th of June of the 20th anniversary of the election as Archbishop of Tirana and All Albania of His Beatitude Archbishop Anastasios, which was the day that our Church began its canonical restoration. On this occasion the festive Divine Liturgy was led by Archbishop Anastasios, together with all the members of the Holy Synod of our Church and numerous clergy. The Liturgy was attended by believers from Tirana and all across the country, who came to celebrate this special day together. At the end of the Divine Liturgy, Archbishop Anastasios was greeted by the Metropolitan of Berati, His Grace Ignati, who emphasized the missionary efforts of His Beatitude Anastasios and the example that he gives to all Orthodox people. Then the Metropolitan of Korca, His Grace John, expressed his gratitude for the great deeds of the Church and the overall contribution of His Beatitude Archbishop Anastasios for the development of the Church and all of Albanian society. This Divine Liturgy was attended by several clergy friends from Montenegro, who expressed their best wishes and the sense of wonder that they experienced when they saw what a strong recovery from the ruins has been achieved in 20 years. Archbishop Anastasios also expressed his thanks for the appreciation that was expressed and conveyed his best wishes, noting that in the past 20 years the Orthodox Church has been seen as a significant presence in the development of society. “… Let the God of hope fill us all with joy and love …” exclaimed Archbishop Anastasios during his speech. This celebration highlighted the pride and appreciation that we all have for the leading figure of the Church, for his spirit of peace, understanding, wisdom and respect for every human being. He has led the Church in times of peace and in times of turmoil, always with wit and wisdom, and the Orthodox Church is an important factor in the social development of Albania. This entry was posted in Featured News, News and tagged Albania, Albanian Orthodox, Archbishop Anastasios, Orthodox Autocephalous Church, Orthodox Church by OCP. Bookmark the permalink.